I realized that I already drew a response for ‘Beckon,’but I must have had a reason for keeping it on the list. I do like this one better than the first. I didn’t include a lot of detail. I might go back and add more detail later, but perhaps not. You can see the original prompt and create your own response. In addition to sewing I have been cutting. All of the pinks in the Pink Donation Quilt have a square in the piece on the left. There are a few from some fabrics I bought in the last little while. I also have some patches from the Art Gallery scraps I received. I have to admit that I arranged the scraps a bit so they look good in the photos I post for you. Look for these patches in the final piece. I am back trying to post the abundance of Creative Prompt Project Responses I drew a week or so ago. This is abundance. 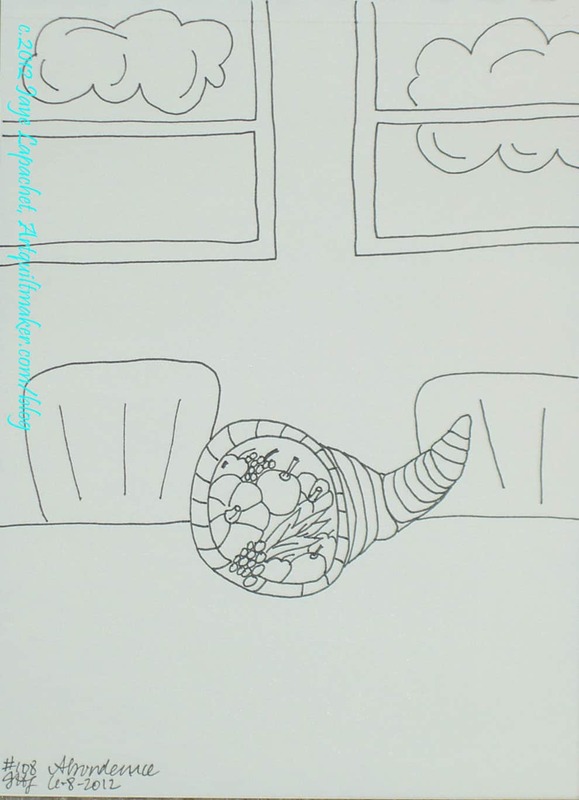 I always wanted a cornucopia, so I thought I would try and draw one. Drawing things with a lot of elements can be a bit tedious, but I am pleased with the result. Roman bridge built by ancient Romans, were the first large and lasting bridges built. Roman bridges were built with stone and had the arch as its basic structure. (see arch bridge). Most utilized concrete as well, which the Romans were the first to use for bridges. Bridge cameras are cameras which fill the niche between the single-lens reflex cameras (SLRs) and the Point-and-shoot camera. World Bridge Foundation: The official site of the body responsible for organizing world championships. Definition: A bridge is a structure built to span physical obstacles such as a body of water, valley, or road, for the purpose of providing passage over the obstacle. Designs of bridges vary depending on the function of the bridge, the nature of the terrain where the bridge is constructed, the material used to make it and the funds available to build it. Make your response simple. It doesn’t need to be a masterpiece. Take 5 minutes. Just respond and create a creative habit. Please post the direct URL (link) where your drawing, doodle, artwork is posted (e.g. your blog, Flickr) in the comments area of this post. I would really like to keep all the artwork together and provide a way for others to see your work and/or your blog, and how your work relates to the other responses. The Creative Prompt Project has a Flickr group, which you can join to post your responses. Are you already a member? I created that spot so those of you without blogs or websites would have a place to post your responses. 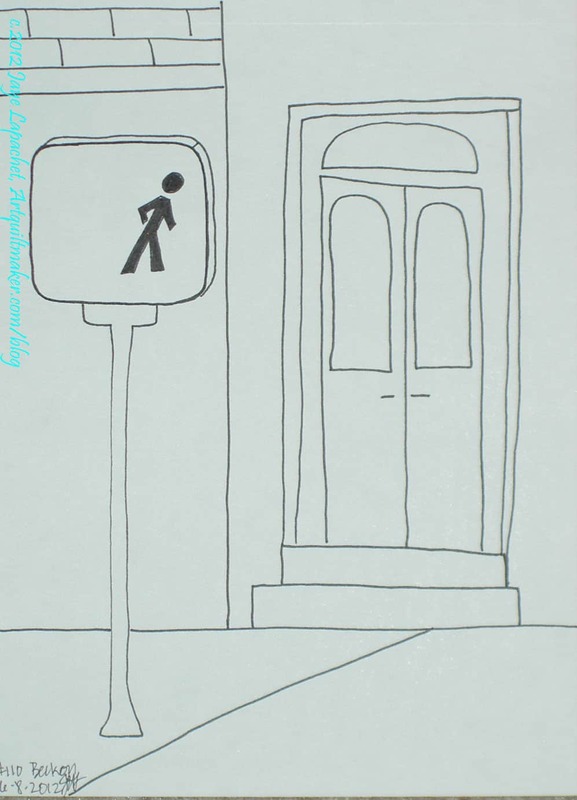 Please join and look at all of the great artwork that people have posted. I went downstairs this morning to get some water before I started my day. 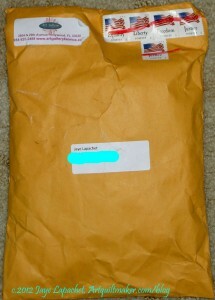 I hadn’t see the mail from the day before and it was sitting on the dining room table. I glanced through it and noticed two handwritten enveloped addressed to me. I recognized the addresses as being from the recipients of the Stars for San Bruno quilts. My heart fluttered a bit. I didn’t get a response to my emails and notes, so I didn’t want to say anything to you when I sent the quilts off last Friday (return receipt requested) in case they were not well received. Crazy talk, I know. Sometimes I can’t help myself. I was kind of afraid of what I would find when I read the notes, so I went and got ready for work and started my breakfast before I read them. I really never know how people will respond. Will they hate the look of the quilt? Will they feel resentful because they feel obligated to me? I rarely ever send anyone anything with the expectation of getting something back. The reviews I do for Lark Books I do as a service to YOU. When I send letters to my friends, I send them with a sense of joy in my heart that they will receive a handwritten letter they can enjoy. There was no reason for me to be afraid. Their notes were grateful and heartfelt. They made me cry. “Words can’t express the feelings that T and I felt. 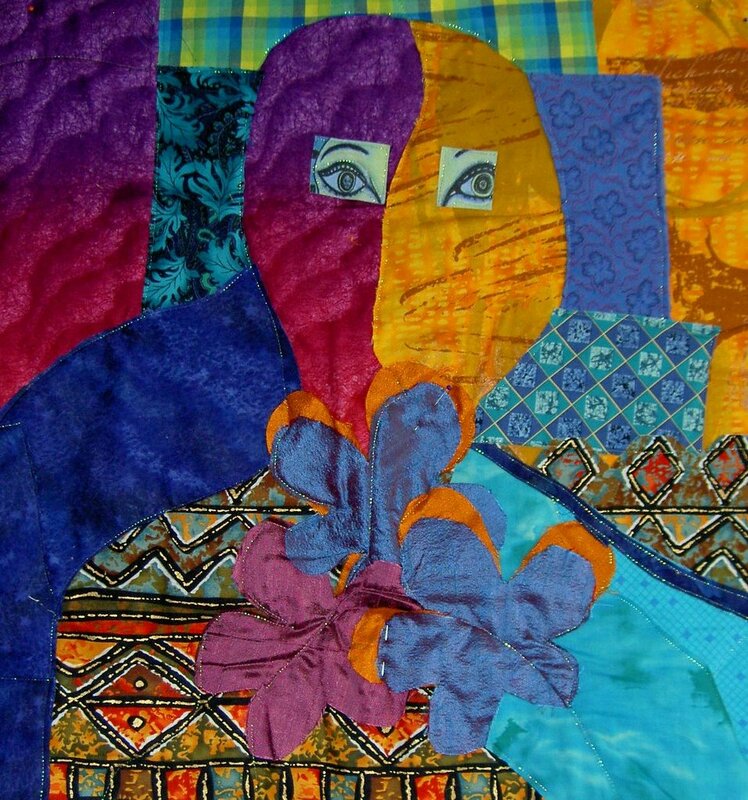 Tears of happiness to know that so many wonderful people put their hearts and hands into such a beautiful quilt…. I am so pleased. I am pleased that the quilts were accepted with the spirit in which they were sent. I was pleased to get such heartfelt thank you notes. Those notes made all the difference. Note to those who participated: I will scan the notes and send them off to you separately. Yes, here is the pink donation top. It will go off to Jennifer and Deborah the Charity Queens of Awesomeness at the next BAMQG meeting. 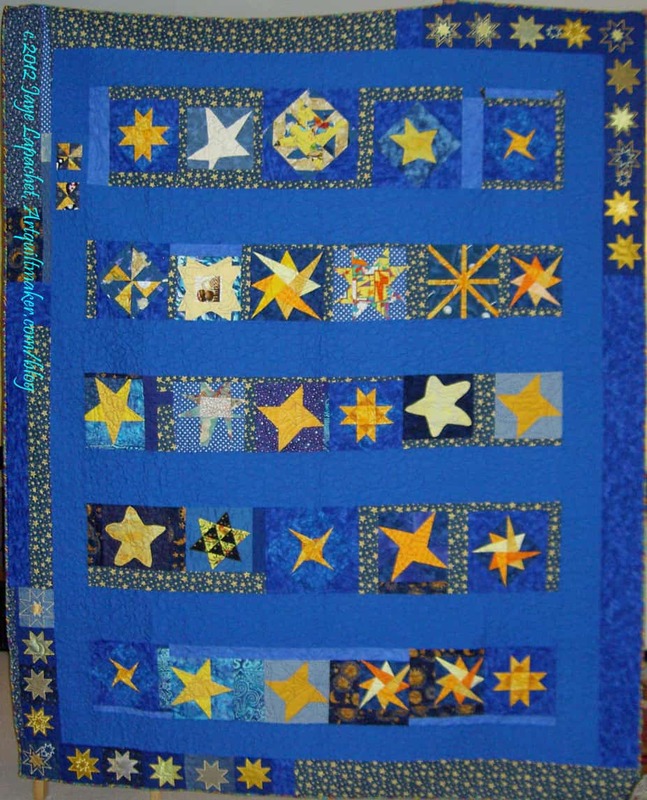 As you might remember (since I know you memorize all of my posts), there was some lively discussion about the white sashing I used last time on the Blue Donation Top and how the quilt would look with sashing the same color as the foreground patches. Now you know. This top is very pink. DH even commented that it wasn’t usual for me. I like it and definitely put it in the cheerful category. I made the back, too, but it is nothing to write home about, so no photo for you. This was made entirely using leaders and enders method while I was piecing other things such as the latest Swoon block, the Corner Store and some other random blocks that you will hear about soon. See what you can accomplish? Now I am working on a yellow version from the Art Gallery Scraps, plus a few other yellow scraps I scrounged up. For those of you counting, this makes two finished tops this week. Yes, TWO!!! After not having much time to sew, as described previously, I spent a lot of time sewing over the weekend. In fact, aside from a quick trip to dinner and a movie with my favorite date and a few other minor chores (no gardening! ), I spent the whole weekend sewing. The Corner Store seems to have taken me a long time. Looking back, I don’t think it should have been on my 26 projects list. After all, when I wrote the 26 Projects List it was just a placemat and an idea; it wasn’t really a UFO. Still and all, I put it on the list and I have decided that everything on the list will get a disposition. 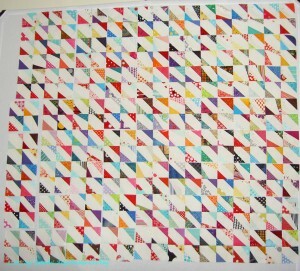 Over the weekend, I made significant progress on this quilt. 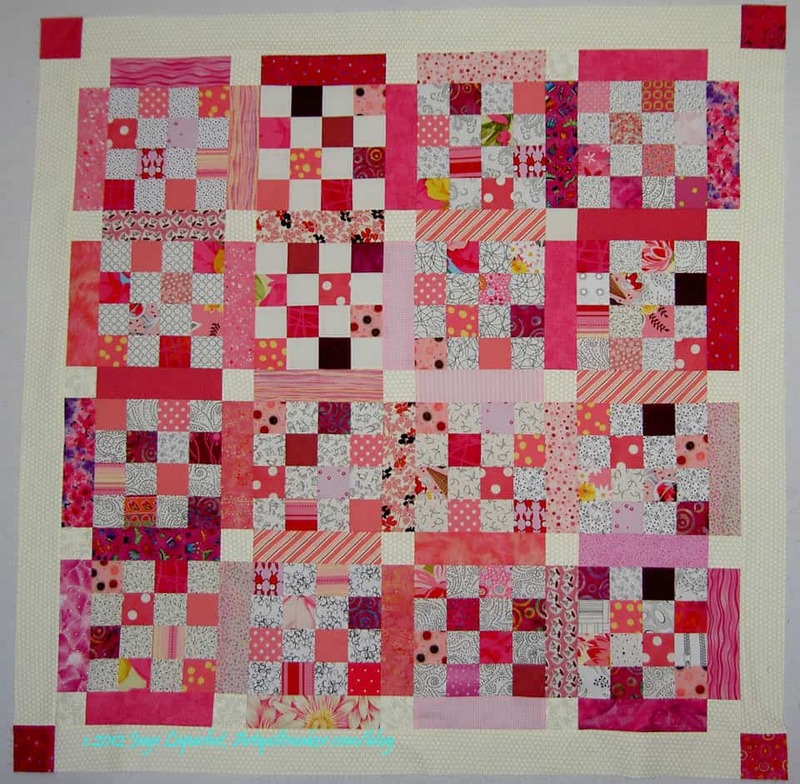 The picture above shows what I had done previously – most of the blocks were sewn together in groups of four. I had started to sew those groups together, but didn’t get very far, so that is what I worked on. One after the other, I sewed the groups of four into groups of 8 and then the groups of eight into groups of 16. Basically, I chunked them. In between, I pushed bits of the Pink Donation Quilt through the machine and made significant progress on that as well as a bit of progress on the yellow version which is the next donation quilt on the list. Another post for another day. Stay tuned. I finished the top and am well on my way to finishing the back. I am going to use a big piece of a Phillip Jacobs print called Japanese Chrysanthemum. This fabric was destined to be a very nice bag, but I think, even though I bought the pink colorway, that there is too much brown. I am just not a brown person. I had planned to put a spiky border a la Gwen Marston. 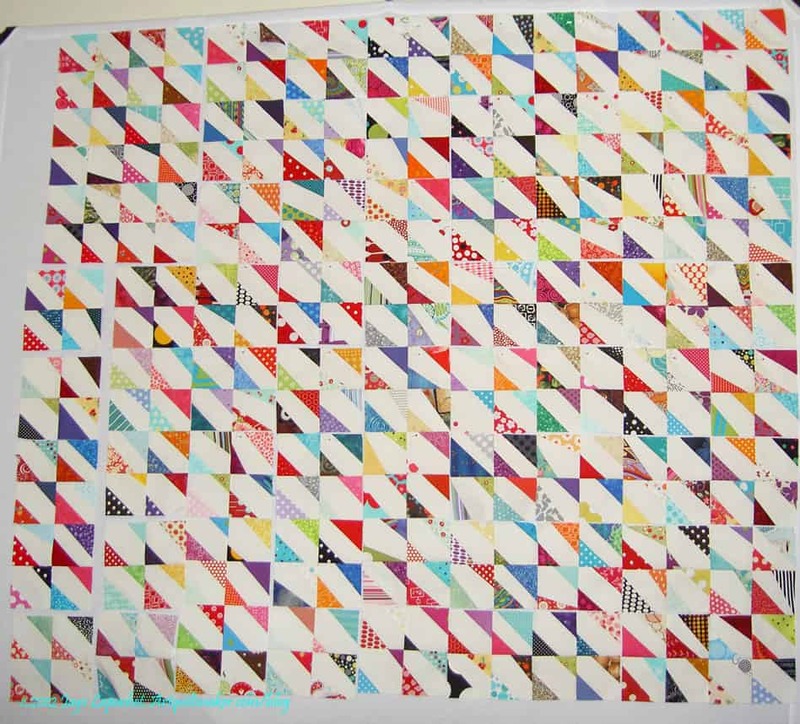 The Molly Flanders blog has a very nice tutorial, which shows a similar quilt to this one with the spiky border I decided not to make. Ok, here is the confession. This is a pretty quilt top. It is well made, my corners match, etc, but this top has no soul. If I weren’t compulsive about getting project finished, then it would be an interminable UFO. I don’t know why it has not soul, but it doesn’t. I’ll finish the back, get it quilted and then figure out what to do with it. It is a little too girly for one of the boys, but we will see. So it goes, sometimes. I thought I would make up an example of one way you could put the Block-a-Long blocks together in a sampler format. This layout looks a lot more complicated than it really is. Remember each block is relatively easy. 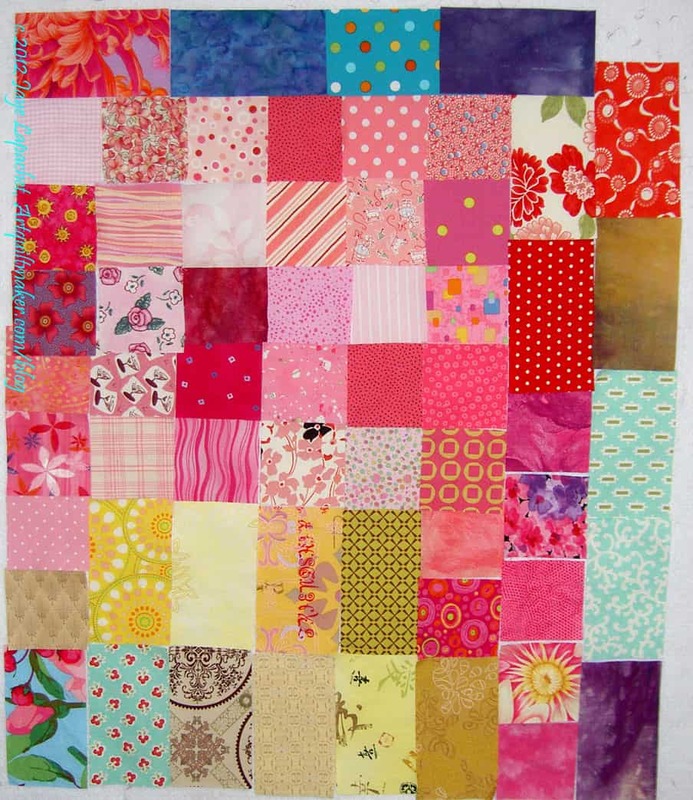 Of course, there are a multitude of ways you could put together a sampler quilt. 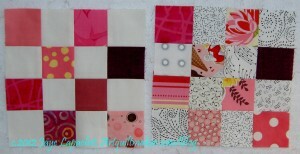 I was thinking that these blocks would lend themselves to a scrap quilt. 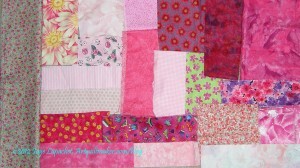 As you get scraps large enough to make one of the blocks, make one, then eventually you would have enough for a quilt. It would be a nice memory of projects you did in a year or over a period of time. I haven’t had time to do more than glance through them, but for some reason, I wanted to let you know that I had a couple of new books. 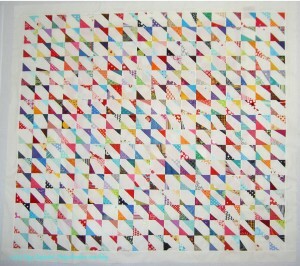 Color Magic for Quilters is all Sandy’s fault. That is Sandy of Quilting…for the Rest of Us. I’ll have to think of something so she will spend her money. She is doing a mini-project called Total Color Tuesdays post on her blog every Tuesday (stealing all of my glory for the upcoming design episode on color, I would like to point out). You can participate in her exercises. 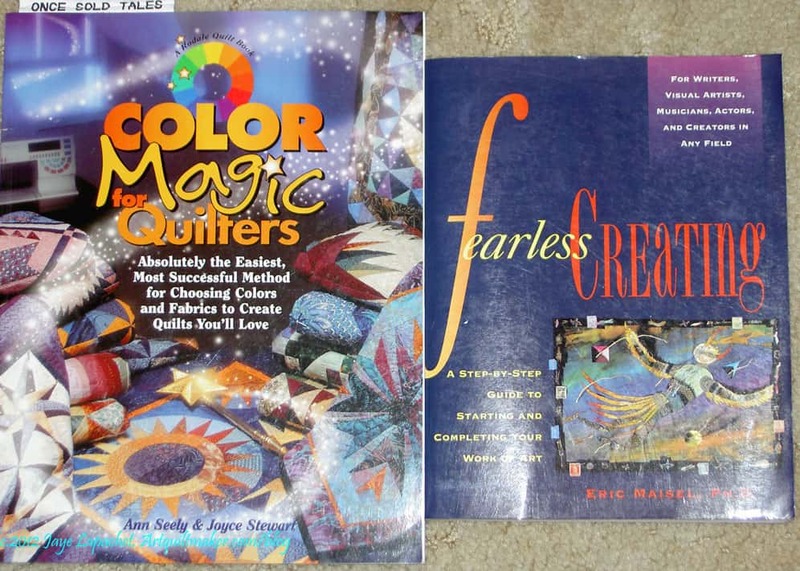 Color Magic for Quilters uses a different system than Munsell or Ives. I don’t know which;you’ll have to wait for my review. I’ll read the book and get back to you. Fearless Creating is a book I won as a door prize at the last BAMQG meeting. I am not a big door prize fan. I don’t object to them, but I just usually don’t want what people are giving away. This time I really wanted this book and nearly grabbed it out of someone’s hand as we were called at the same time. I told her I would loan her the book. She was on the fence about it anyway, so I don’t feel guilt. 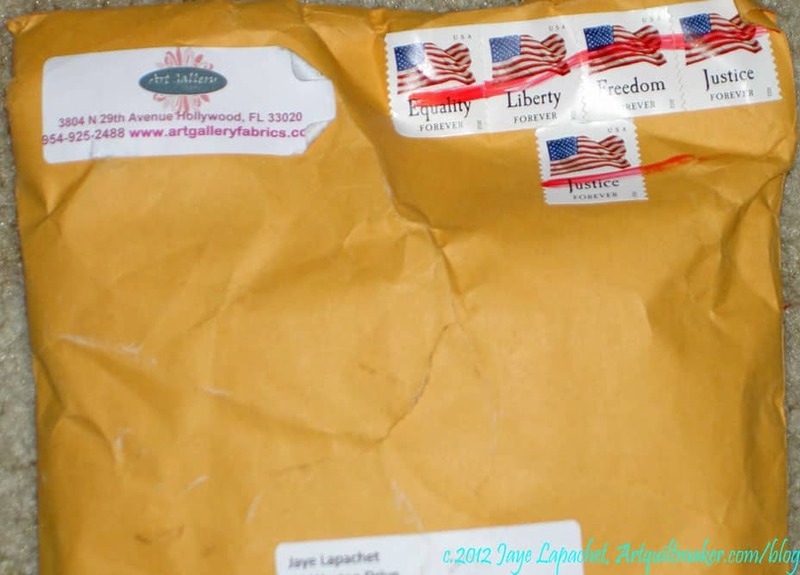 I received a bunch of scraps from Pat Bravo at Art Gallery Fabrics. She offers them periodically and ‘scraps’ is a total misnomer. The most bright and cheerful fabric was a scrap, but everything else was half yards or slightly smaller. Compared to what I consider unusable, these ‘scraps’ were a trip to the fabric store. 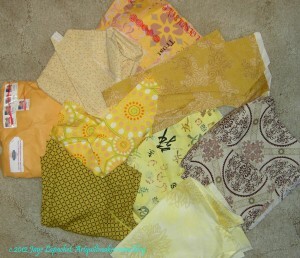 All the fabrics I got were in the yellow family. Some of them were gold. Some more on the brown side. There were two fabrics with words on them, which I liked, but refrained from looking up on Quiltshops.com. My intent was to make an entire quilt with the foreground from this package of fabrics. I am not sure that is possible. The quilt might be a bit too boring. 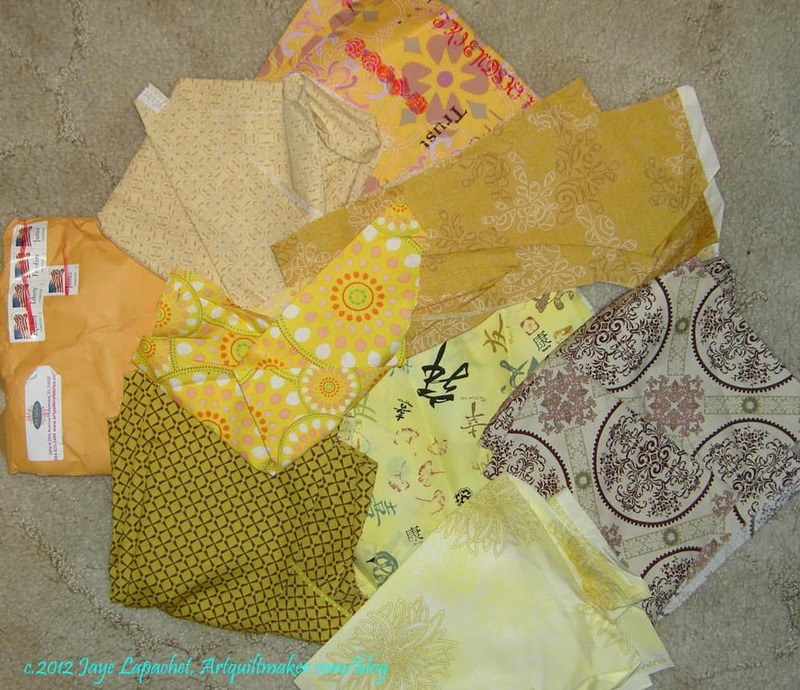 I have a few yellow fabric squares that I have been cutting, so I’ll see about adding those in. I washed the fabric, as is my habit and got to work. I took the opportunity to cut a few pieces for myself, but really, I cut them into 8″ squares to cut on the Accuquilt, which I did. I think it is so interesting that Pat and her crew color coordinate the scraps. This is a fabric combination that I would never put together myself, but it is one, which is somewhat appealing and I am looking forward to the challenge of trying to make it work. I need to finish the Pink Donation top before I can start this one and I need to cut some background fabrics. Where are we now?I am the grass. Definition: Grasses, or more technically graminoids, are monocotyledonous, usually herbaceous plants with narrow leaves growing from the base. They include the “true grasses”, of the Poaceae (or Gramineae) family, as well as the sedges (Cyperaceae) and the rushes (Juncaceae). The true grasses include cereals, bamboo and the grasses of lawns (turf) and grassland. Sedges include many wild marsh and grassland plants, and some cultivated ones such as water chestnut (Eleocharis dulcis) and papyrus sedge (Cyperus papyrus). Uses for graminoids include food (as grain, sprouted grain, shoots or rhizomes), drink (beer, whisky, vodka), pasture for livestock, thatch, paper, fuel, clothing, insulation, construction, sports turf, basket weaving and many others. repression, love, heartbreak, and manic-depression. snake, is a European nonvenomous snake. There should be a reality show called Vendors Behaving Badly. It couldn’t be any worse than the reality TV shows on channels today. When copious amounts of caffeine and chocolate didn’t work, I took myself off to the John Berggruen Gallery to look at the Wayne Thiebaud exhibit they have on display. 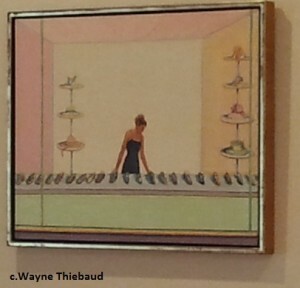 I love Wayne Thiebaud’s work. I love the way his brushstrokes look. I love the way he paints regular things. The cakes and pies and other desserts are kind of special, but they are also normal. 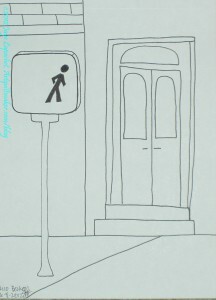 I strive to be a bit influenced by his work in my own drawings for the Creative Prompt Project. 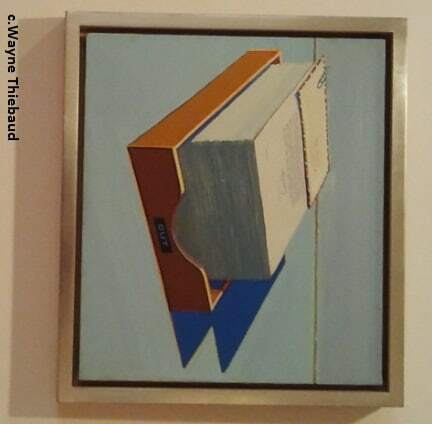 One of the things I like about his painting of the out tray or letter tray (don’t know the real title) is the writing. The way he painted the writing really makes it look real, if a bit blurred. I am interested in his technique, because of my recent attempts at including writing in my Creative Prompt Responses, e.g. #141. I tried to notice things about his work and not do just a “drive by” viewing. This was an interesting selection of his works. I had seen similar paintings, but I am not sure if I have seen these exacts images. I prefer his cakes and desserts to his landscapes, so I made myself really look at the landscapes this time. 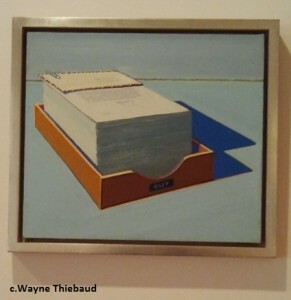 I think of Mr. Thiebaud as using very thick paint. I didn’t see that as much in this exhibit in general, but also didn’t see it in the landscapes. I wonder if he uses a flatter painting technique with his landscapes? I was able to still see the brush strokes when I looked at the paintings at an angle. I couldn’t see 3 dimensionality, however, looking at the painting straight on. The strokes on the backgrounds were very vertical, which I think added to the sense of extreme hills. The landscapes were almost a caricature of the City. He used subtle colors and different colors that one would expect for a landscape – blues in the trees, turquoise and yellow. The colors add interest and are effective. There were a few paintings from the 1960s and some from 2004, 2007, etc. It was very interesting to see the evolution in his work, not only in technique, but also in the changes to his series. One thing I noticed in the Hats and Shoes painting was the pink ceiling was a slightly lighter pink than the wall. Very effective. I am pleased that I went. I would love to have the space as a studio! This list is really funny. I want to scratch items off of it, but I don’t want to rush through them either. I find that, now, I pick up a project and intensely work on it until it is finished. Any projects on this list are projects I have decided I want to work on. At least I want to work on them at the moment. If I decide I don’t want to work on them anymore, I will abandon them. Here is the list, again, still in no particular order, except that I have put some of the “mostly finished” projects at the end. This time, like last, I have moved the finished pieces off. Still 23 WIPs left, because I added the Wonky 9 patch. Darn you inspiration! Original Bullseye: needs border, backing, quilting and binding, which are all hard to do if you can’t find the project. It is lost. I know it is in there somewhere. As I mentioned, I did a test and found that my original idea didn’t work. I think a plain border will set off the blocks fine IF I ever find the top. Bleah! Corner Store: All blocks are made (an additional 11 were made on 6/17). I have now sewn all the blocks together in groups of 4. On 6/17, I also started sewing the groups of 4 to each other. Infinity blocks: Am starting to think this would make a good nephew quilt. A-B-C (A-Z) BAMQG Challenge – I am actually not sure if this should be considered a WIP (Please say no! ), because I just barely have enough blocks with which to make something. I am making good progress. I have S and T blocks on my mind. 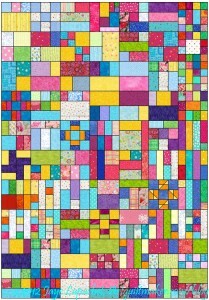 I am really thinking about just making all the blocks, putting sashing around them and then trimming the sashing a bit so the blocks are all a uniform size. They are not wildly off, but they are a bit off… I could bring them to BAMQG as the blocks are due. We’ll see. 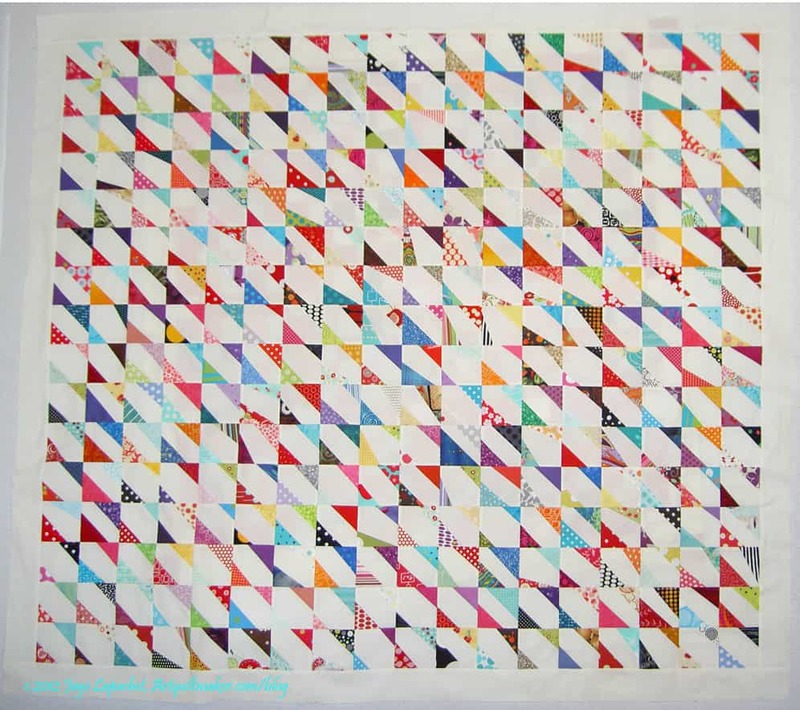 Aqua-Red Sampler – steady progress has stopped and the class more than the quilt is really weighing on my mind. As far as I know Frances has finished her Dresden Plate, so perhaps we will start up again soon. The next class was going to be fusible machine applique’, but I haven’t gotten past cutting out the templates. Perhaps I should skip to machine piecing curves? The Tarts Come to Tea: I haven’t quilted on this since April 2011. I need to work on the quilting. I was making good progress and then got sidetracked. 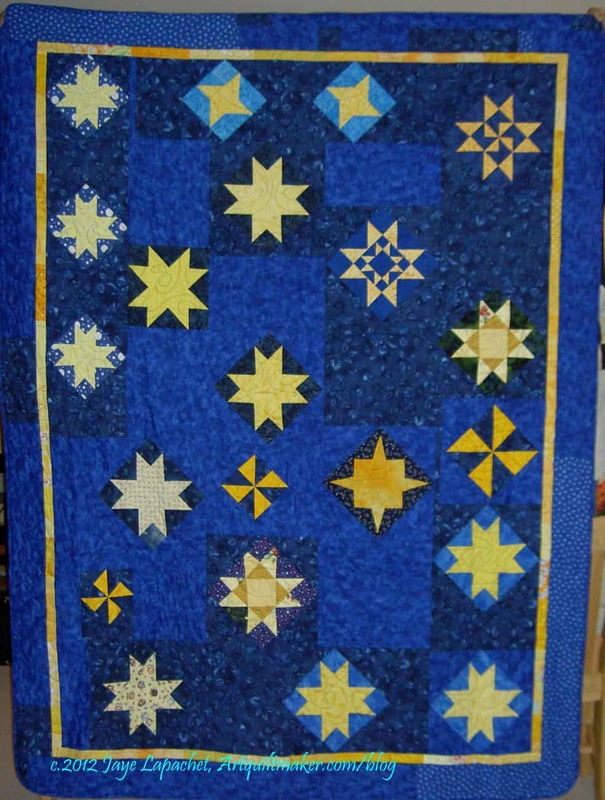 I have been quilting another quilt and that is getting me back in the swing of quilting. Now that my machine is happier, perhaps it is a good time to take this piece out again? I would like to finish it. 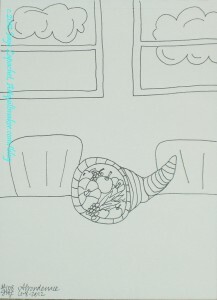 Garden: I started this piece in a class with Pamela Allen in 2006. As mentioned, I used this piece for my beading demo for the 2012 EBHQ Voices in Cloth show (March 17), which means that I added some beads. I started on the machine quilting late in April and am almost finished with the background. I was kind of stuck on the flower petals, but may FMQ them now that my machine is feeling better. Flower Garden: I still find the ‘flowers’ too spiky. I think I need to soften them up a bit. 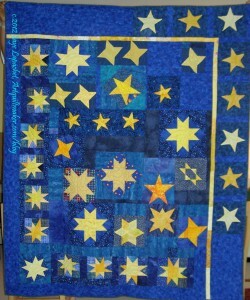 Moon and Stars: need to finish hand quilting. This quilt is not interesting. This is month 2 that I have thought this is a candidate for abandonment. 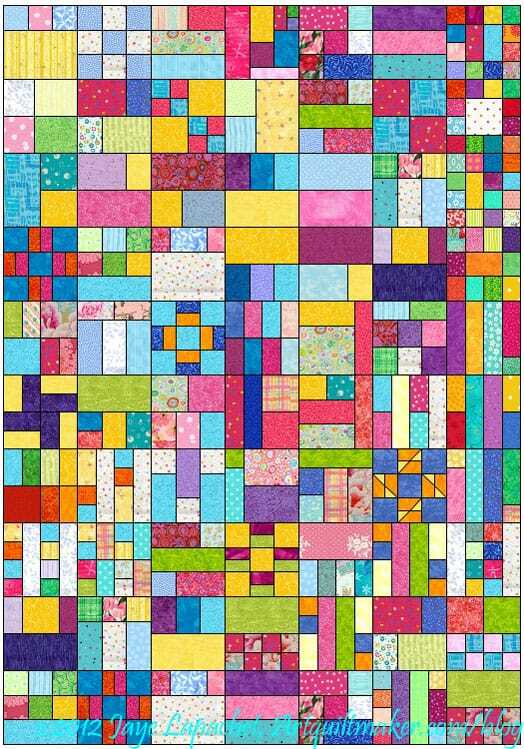 Pointillist Palette #4: Fourth is a series of 6 quilts; needs tiny square patches sewn together. Good leaders and enders project. I wonder if I cut the squares accurately? Spiderweb: need to make sure that I have the right number of blocks for the size quilt I want to make. Need to make sure I have the border pattern and start sewing border blocks. New: Super Secret Project: top, back and binding made. Ready to go to the quilter. Stayed tuned. 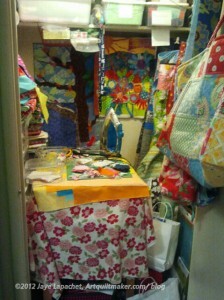 FOTY 2011: at the quilter, needs binding. Stepping Stones: at the quilter, made binding, which she will sew on for me and then I need to hand sew. Jelly Roll Race: at the quilter. Needs binding, quilting, sleeve. Wonky 9 Patch: needs quilting and binding. 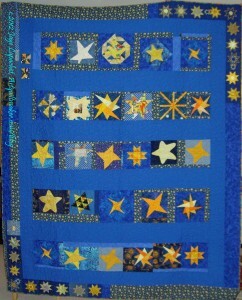 Stars for San Bruno #2: Finished! YAY! Pineapple: Abandoned; will remake blocks at a later time with more care. 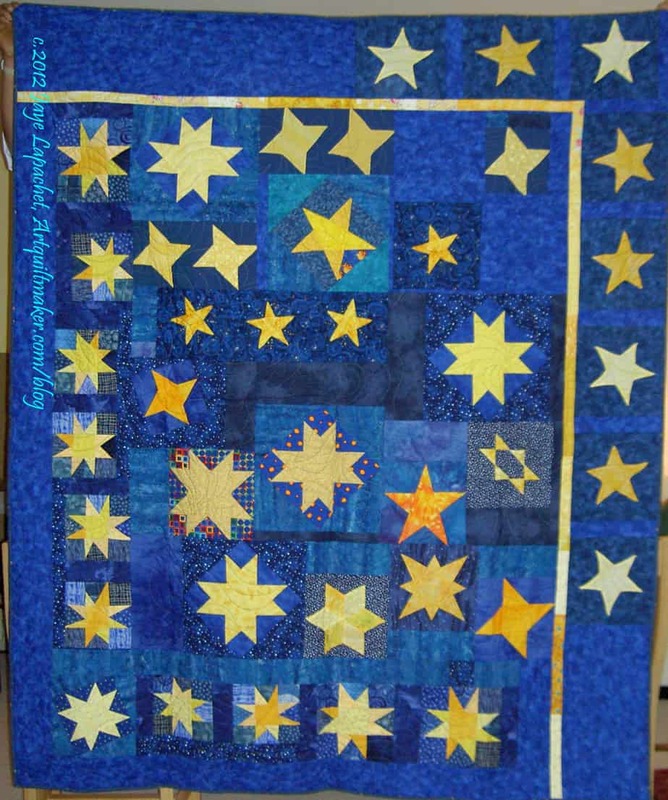 Stars for San Bruno #3: Finished! YAY! Food Quilt: Finished 5/24/2012. YAY!!!! I am working steadily on the pink donation blocks. I have all 16 finished, though I just had 12 finished when I started writing this post. I have the Corner Store on the portable design wall, so as soon as I finished the last donation block, I started to cut sashing. I haven’t cut all the sashing, but started to sew sashing onto donation blocks anyway in between sewing Corner Store blocks together. I can’t see the blocks all together yet, because, as implied, both design walls are covered (could I, possibly, do fewer projects at once?) with other projects (A-B-C Challenge, Swoon, FOTY 2012, Corner Store). I have about 6 blocks sashed and need to cut a bit more sashing. 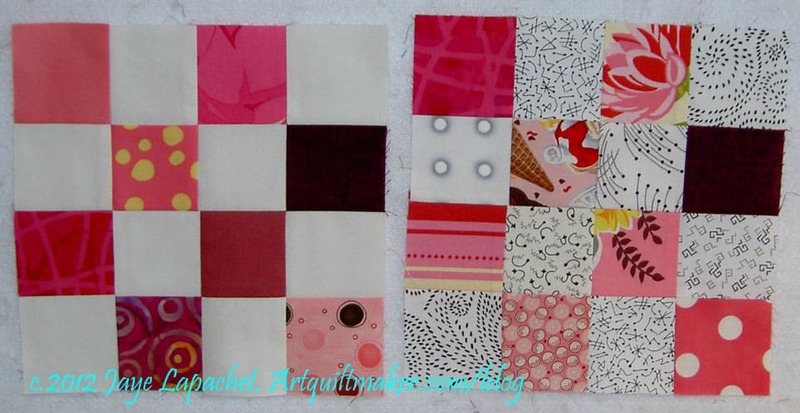 In between sewing, I also cut some ~8″ pieces to make additional pink 2.5″ squares for a future donation quilt. I used the ~8″ pieces to cut 2.5″ squares using the Accuquilt. I have a big stack waiting for me to sort. 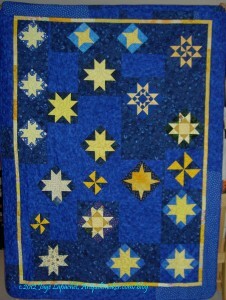 The blocks are all a bit different, but I used many of the same fabrics, as I did in the Blue Donation quilt. 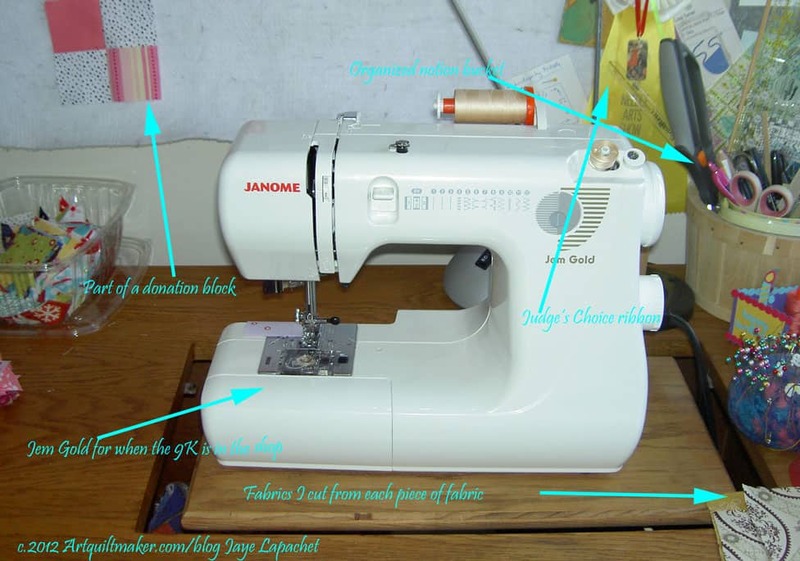 I intended to make the top and back and give it in to the Charity girls at the BAMQG, but since my sewing machine seems so happy, I wonder if I could practice some free motion machine quilting on this piece? The last time I did free motion quilting, it was such a disaster that I might have developed a phobia. I have to see if I can do it…physically, too. I am going to use the large piece on the left as backing. It is a very soft lawn, I think, and a bit thin, but I think it will be fine. Most of the fabrics Mrs. K sent were shards and strips. I washed them all and am preparing to cut them up into squares. A couple of the pieces, in addition to the lawn, are larger – FQ sized or so. Perhaps they will go on the back as well. We will see. You know what this means, right? Yep, the 9000 was in the shop. Bleah. Or so, I thought. It wasn’t really bad, though. I took the 9K to a place I used to take it to. The owner is a used car salesman kind of guy, but I wasn’t happy with the last service, so, at TFQ’s urging, I went back. I took the machine in on a Friday and they called me SATURDAY to pick it up. I kid you not! I was amazed. The repair guy said that he had several similar machines to service, so he did them all at once. I went on Monday after work (2 hour round trip) to get it. Houseguests arrived that very evening. You know what that means, right? No sewing. Yep. No fabric pressing or fondling. Nothing. I didn’t get to test the machine. I took everything down – iron, ironing board, cutting table and put it all in the closet. I am fortunate to have a husband who may not like it, but doesn’t complain about the way I have taken over the upstairs closet. I pinned the Corner Store pieces to the portable design wall and made the bed. I didn’t get to test the machine until Friday. Yes, the following FRIDAY. Friday afternoon, as a matter of fact. I am glad I took it to the car salesman shop, though, because my sewing machine feels like her old self. The feet are actually holding the fabric to the bed of the machine. I had forgotten that it did that. The repair man said there was a belt problem. I sewed like a demon on Sunday. Stay tuned for that report.